← How to convert MS PowerPoint documents of ppt to jpg? Have you ever tried to show your presentation in the form of image? Or have your tried to insert your ppt to your other documents say word document in the form of image? If not, now I will show you how to make it, which means I can convert the PowerPoint to image, say PowerPoint to bmp. Then you can use the image file freely. In some degree, converting PowerPoint to bmp can save the PowerPoint in a safer way and upload in a quicker way. 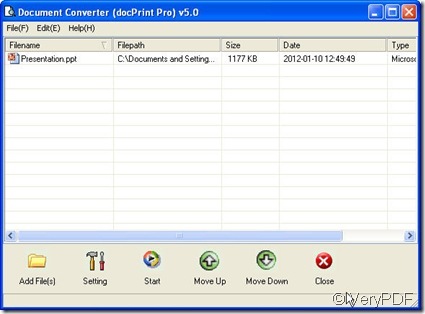 I do the conversion from ppt to bmp under the help of one software named docPrint which can help you convert all the printable files to images or PDF file. If you feel that you are eager to know more about it, you can visit its homepage by clicking here. Now I will show you how to do the conversion from ppt to bmp according to my experience. At first, I will allow this software to run on my PC. For your better understanding of my way, I will show the snapshot of this software in the following picture. Second, I will drag my files needed converting to this software. Btw, the interface of this software can be dragged to endless long and wide then you can add files as many as you need. No matter how many files you add, it can finish the conversion in a short time. Third, I will design my bmp file by clicking the button “setting”. then I will enter a brand new menu label where I can choose the output file format as bmp ,set the color depth and image resolution for my bmp file. Forth, as I feel all the preparative work has been done, I can let it work for me. Then I click the button “Start” to do the conversion from ppt to bmp. Once you click that button, you will be asked to choose a folder to save the converted bmp files. A few seconds later, I witness my success by the converted images in the chosen folder. Now the conversion from ppt to bmp is over. This way is also available for other file formats converting. If are confused by file formats converting or you have any good ideas for this software, you are welcome to email us at support@verypdf.com or come to our live chat. Thanks for your reading and visiting in advance. This entry was posted in docPrint Pro and tagged PowerPoint to bmp, ppt to bmp. Bookmark the permalink.